Ever wonder? “What keywords do I rank for?” It’s a great question with surprising answers. You probably rank for hundreds or thousands of phrases you didn’t know about. How do you check your rankings? This post explains step-by-step how to check your rankings using Google Analytics and Google Search Console. We’ve also added a list of tools at the bottom for checking the rank of your competitors. But before we get into the details, let’s consider a specific reason to check the rank of specific pages. This is very important info because it can help us avoid big SEO mistakes. Note: Skip down past these first short sections to get to the rank checking instructions and tools. We’ve written about this (and made a video showing how to do it) on this blog. 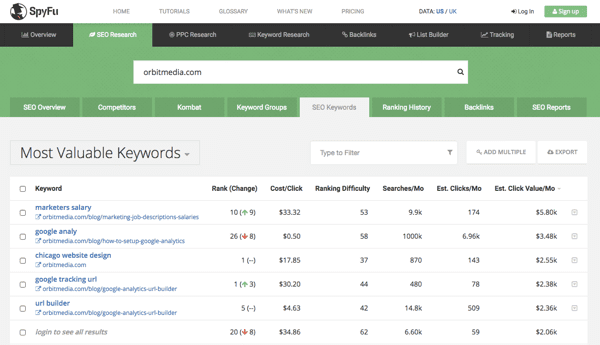 Read How to Improve Your Rankings Fast for instructions. It’s amazing how quickly you can rank higher using this technique. But we didn’t go into detail on one important aspect. There’s risk involved. Although you may be optimizing a page for a phrase, you may be DE-optimizing the page for a different phrase. The page may already rank high for a different phrase. Or it may rank for a more popular phrase. Changing a page to make it more relevant for one phrase may make it less relevant for another. If the page ranks for one phrase, it probably ranks for many. That’s because Google is a semantic search engine. It does an excellent job of understanding the true meaning of the query and the intent of the visitor. It’s not just matching words and phrases. In the old days, a page would rank for a phrase or two. But today, pages are viewed as relevant to a broader topic, not just one specific keyphrase. 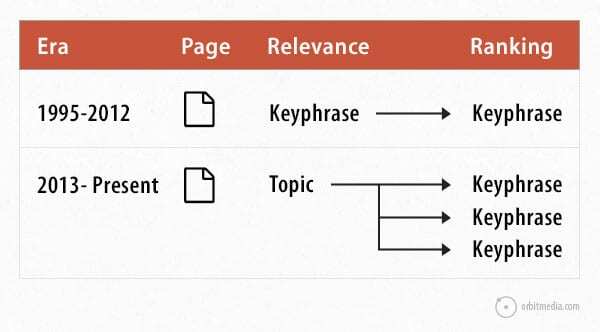 A page is more likely to rank for dozens of phrases. Some may be very powerful at pulling in visitors. Others, not so much. You found an SEO opportunity, and you rush to better optimize the page. You push the phrase to the front of the title tag. You rewrite your header. You re-order words in the body text. But did you just make the page less relevant for an even better phrase? Here’s an example. 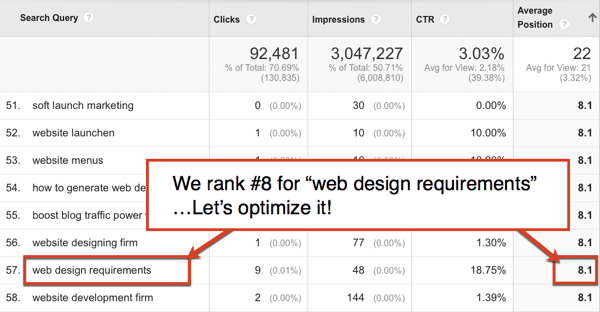 A quick check of the queries report shows that this site ranks #8 for “web design requirements.” That’s a page one ranking, but there’s room for improvement, right? Before we start changing the page, let’s slow down and make sure we don’t hurt another hidden ranking. Let’s find all of the phrases that this page ranks for. How can I find all the phrases that my page ranks for? What do I rank for? It’s an important question! This is the section in Analytics pulls data from Google Search Console, but you have to connect it first (instructions are here) If they aren’t connected, you can do this directly from Search Console following the instructions below. Note: Data in this section only goes back three months. You’ll know which page by searching for the ranking phrase in Google and checking the search results. Now find it in this report by scrolling through or using a filter. Click on it. Now you’re looking at some very valuable information. This is a list of all the phrases the page ranks for. You may be sad to see that the “post-click” data is gone (bounce rate, pages/session, conversion rates, etc.) 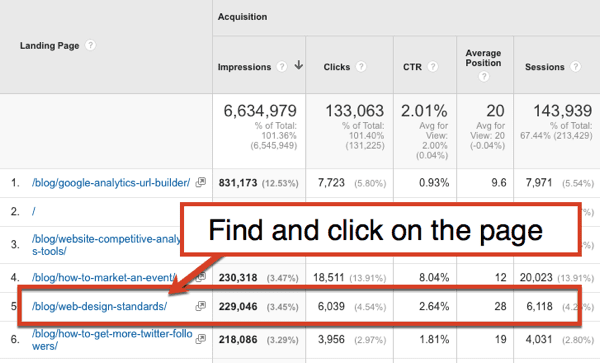 but the search ranking data is here (impressions, clicks, CTR, and average position). You may be happy to see just how many phrases a page is ranking for. Many of these will be very low rankings so don’t get too excited. There are phrases here for which you rank 300+. You’re ranking on page 30 in Google for those. You’re not winning if you’re way down here. Because there are so many phrases, use the filter box to find your original phrase and make sure you’re in the right place. See the original phrase? If so, you’re in the right place. Now let’s look at all the other phrases that it’s ranking for and getting traffic from. Remove the filter (click the little x) and then sort by clicks. This is a list of what’s working. Clicks are (of course) impressions times the clickthrough rate. If there are clicks, things are working well. This is what the page is best optimized for now. In this example, the phrase we were ready to start targeting (“web design requirements”) isn’t high on the list. As it turns out, this page is already performing well for other phrases! Optimizing for one phrase would have DE-optimized for the others. If we had increased the frequency and prominence of one phrase, we may have decreased the frequency and prominence of others. 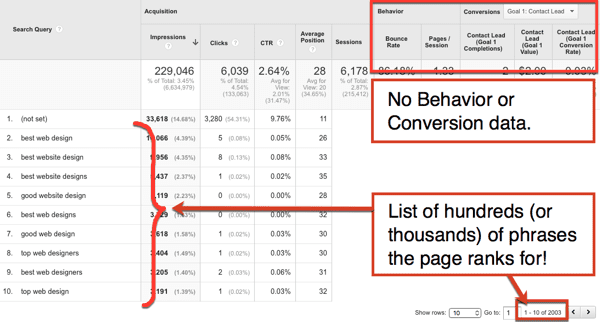 So here are guidelines to follow before optimizing an existing page. First, check to see all the phrases the page is ranking for and getting traffic from. Go ahead and refocus the page on the newly discovered phrase using basic on-page SEO best practices. Don’t shift the keyphrase focus or you’ll risk losing that traffic. But there are still ways you can build up relevance for the phrase using semantic SEO. Consider adding the phrase to the meta description, but don’t remove instances of the other phrases. Make sure the page truly covers that aspect of your topic. In the example above, the article mentions “web design requirements” but doesn’t discuss this in detail. There is an opportunity to cover that angle more thoroughly by adding a paragraph or two. So look both ways before you cross the phrase. The key is to know what’s already working. Actually, there are many ways to find this out. Let’s share a few more. 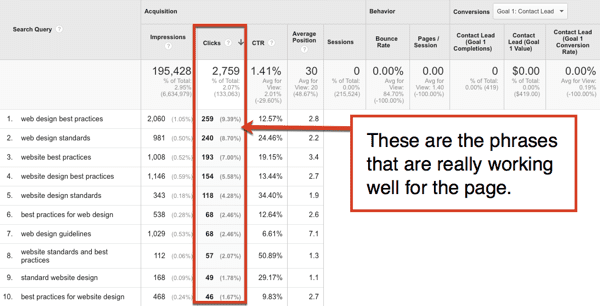 5 more ways to check rankings of your pages …and your competitor’s pages! If you enjoyed finding your own rankings, you’ll love seeing the rankings of your competitors. But before we check the competitive analysis tools, let’s go straight to the source and check our ranking data in Google Search Console. Click the page you want to check. You just added a filter for the report. Now click on “Queries.” This doesn’t take you back to the queries view. It shows you the queries for just the page you selected. That’s weird, but it’s how it works. In the data below, you can sort by position to see the high ranking phrases first. Fun, right? Don’t be surprised if it doesn’t match the Analytics data exactly. These things never do. Find your phrase in this report. For most websites, this is easy to do just by clicking the “Position” box to add this dimension to the report. There are several tools that do this well. All of these tools have free versions, which give you some data, and paid versions which give you more. They also offer much more than the features listed here. 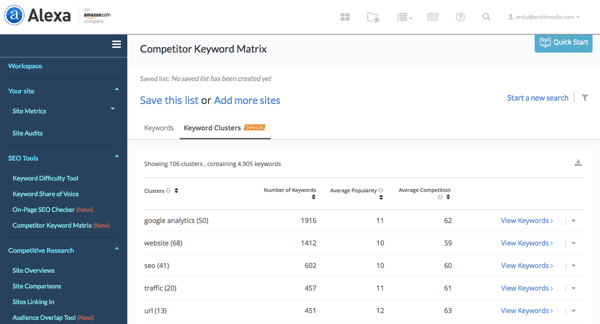 Alexa has recently launched their “Competitor Keyword Matrix.” It shows phrases, popularity and competition. It also groups keyphrases into “clusters” which makes it easier to do quick analysis. Also, the filters have little sliders so you can choose number ranges easily. For this website, Alexa found 4,923 ranking phrases. SEMrush is probably the best known keyphrase research tool. It has tons of data here including the phrase, the ranking, the search volume (popularity), estimated share of traffic and the trend over time. This report is very easy to export. For this website, SEMrush found 14,000 ranking phrases. The top ten are viewable without a paid account. Another very popular rank checking service, SpyFu shows keyphrases, rankings, searches/month (popularity), difficulty, cost per click and paid advertising equivalents, showing the presumed value of each rank. Little colored arrows make it easy to see the change in rank over time. For this website, SpyFu found 4,597 ranking phrases. The top five are viewable without a paid account. 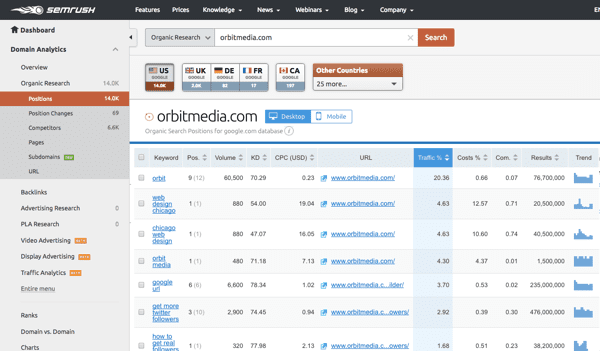 SimilarWeb is another powerful competitive analysis tool. They’re most famous for the accuracy of their traffic estimators (see that analysis here) but they also have a nice tool that shows who ranks for what phrases. It emphasizes percentage of traffic share over specific ranking numbers, which isn’t quite as fun. But it lets you select date ranges and location. That’s smart. For this website, SimilarWeb found 3,031 ranking phrases. The top five are viewable without a paid account. So many ways to check your rankings! Check the rank of your specific pages before you adjust content for keyphrase and topic targeting. Check the rank of competitor sites before you adjust your content strategy or create a sitemap for your new site. Knowledge is power. Use your new powers for good, not evil. Happy rankings! 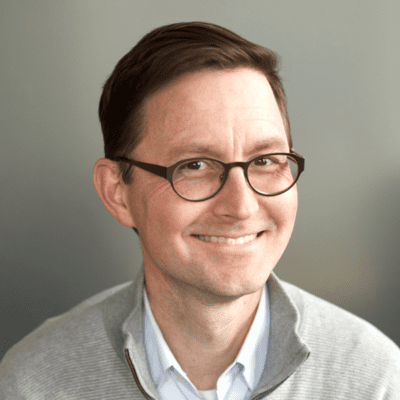 Yes, I haven’t seen many SEOs who talk or write about the idea that content ranks for many phrases and the risk of de-optimization when making SEO changes to existing content. I’m glad you liked this one! You can also check your rankings on Google webmasters tools. I trust that the most.